Bad breath, also known as halitosis, is a result of poor dental regimes and may lead to more serious health problems. Unhealthy lifestyle habits and certain kinds of foods may also lead to bad breath. All food you eat is broken down in the mouth. As the food is digested and transported into the bloodstream it travels to your lungs and is given off as bad breath. Eating foods with strong scents, such as garlic or onion, releases odor that is only partially masked by brushing, flossing, and mouthwash until the substance is out of your body. Failing to brush or floss on a regular basis leads to bad breath. Food particles remain in your mouth encouraging bacterial growth between teeth, around the gums, and on your tongue. According to WebMD, "Saliva is necessary to moisten the mouth, neutralize acids produced by plaque, and wash away dead cells that accumulate on the tongue, gums, and cheeks (WebMD)." Without saliva these cells decompose and cause bad breath. Dry mouth, specific medications, salivary gland issues, or constant breathing through the mouth can affect saliva production. 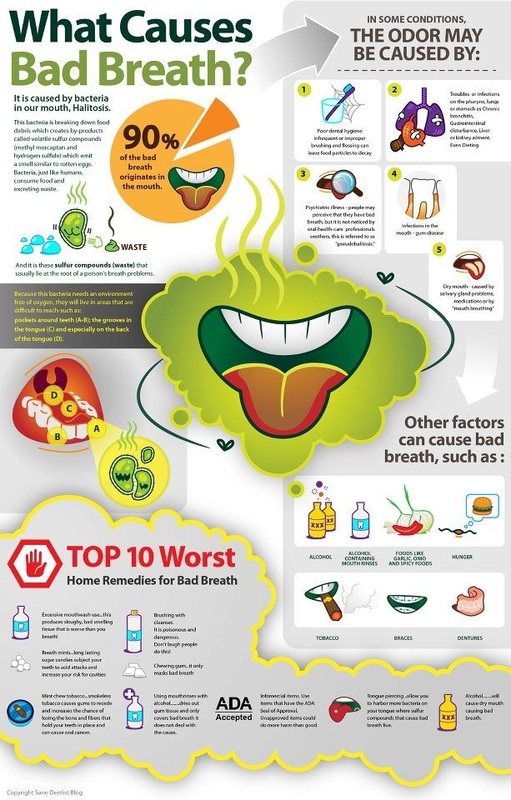 Other conditions that may cause bad breath include cavities, yeast infections, dental appliances such as braces or dentures, respiratory tract infections, etc.